I like old musicals. Old songs. The soaring melodies of Richard Rodgers, cleverness of Noel Coward, the wit and anguish of Cole Porter. I thoroughly enjoyed the outlandish humor of A Gentleman’s Guide to Love and Murder. But I haven’t LOVED a musical play like this in I don’t know how long. Sitting in the Newman Theatre at the Public, I saw what some friends have called the future of musical theatre. After almost three hours riveted to the stage, I was overwhelmed, overpowered, overjoyed by this musical play. Hamilton is hilarious and heartbreaking as good stories and good music always are. Of course, the story is true — Alexander Hamilton, the youngest of our founding fathers, the lowest born, with big dreams of the future of the United States. As for the music, although I don't care for hip hop or rap and didn’t know quite what I was in for — I even brought my earplugs (required for movie houses showing most modern films) just in case the show was over amplified; it wasn’t —I found myself bowled over by the depth and catholicity of Lin-Manuel Miranda’s musical talent, not to mention his intellect. Lin-Manuel Miranda, creator of the book, music, and lyrics of Hamilton, has given us beautiful songs, witty, erudite and heartfelt, in an innovative play. And funny. The music is perfectly modulated and styled based on which character is telling what part of the story. There’s some rap, there are lyrical ballads, songs of ambition, jealousy, anger, love, unimaginable pain. There are vivid characters created, sung, danced before us. History is brought to life. The score is varied and rhythmic and melodic, Andy Bankenbuehler’s choreography exhilarating, the performances universally excellent. Thomas Kail’s direction is tight, bright, flawless. Aaron Burr and Alexander Hamilton are side by side throughout the story, from Hamilton’s arrival in NYC to his death in New Jersey at Burr’s hands. The quietly seething Burr, smoothly then passionately played by Leslie Odom, Jr., is a fine foil to Mr. Hamilton as played by Mr. Miranda. From the lullabies each man sings to his child to political wranglings in the creation of the new country, their similarities and differences are built and grown through the play to its climax. Burr wanted to be in the room where it happened, but it was always Hamilton. These thrilling figures are at counterpoint to one another, surrounded by the ordinary yet extraordinary people in at our country’s birth, and the actors are at the top of their game. 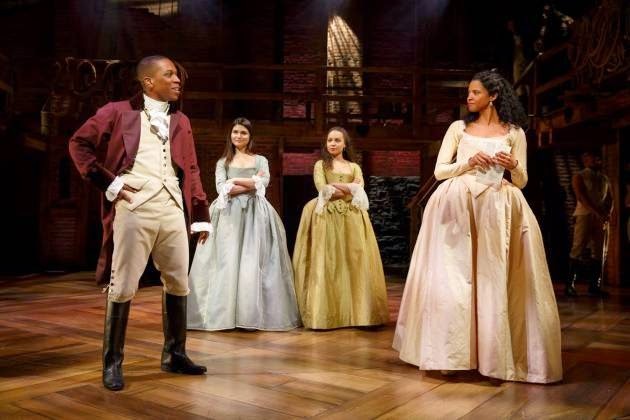 To name but a few: Christopher Jackson as George Washington, Daveed Diggs first as the Marquis de Lafayette and later as Thomas Jefferson, the golden-voiced Renée Elise Goldsberry as Hamilton’s sister-in-law Angelica Schuyler in counterpoint to the sweetly warm Phillipa Soo as Hamilton’s wife Eliza lead a marvelous cast of actors, singers, dancers. And I mustn’t forget the only performer who would not be described as a person of color, Jonathan Groff, who provided a great deal of snide humor as King George. 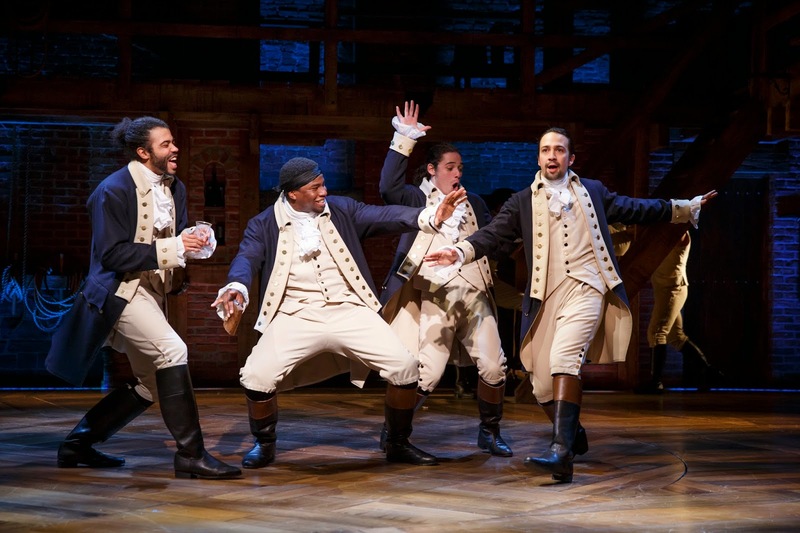 Mr. Miranda’s lyrics are contemporary to us, not Hamilton, but everything about this play is contemporary from the musical and dance styles to the plot. On this 18th century-style stage, we experience remarkably intelligent and tuneful rollicking good fun showing us that nothing changes. Politics, jealousy, love, faith: people are the same. The scenic design by David Korins was appropriately Shakespearean — a “balcony” surrounding three sides of the stage with rolling staircases. Warm wood tones glowed even in the pre-show lighting set up by Howell Binkley. It’s a good space, a not too large house to preserve the intimacy of the direct address from these characters to us, and pretty well raked (with more legroom than any Broadway house). Lin-Manuel Miranda is brilliant and has created a work of art, just magnificent. Unbearably good, unbearably painful, I want to see it again, experience it again, hear it again. And I want to read Ron Chernow’s biography that inspired such an intelligent, educational and moving joining of music, drama, and history. As George Washington says (in the play), "Who Lives Who Dies Who Tells Your Story." Lin-Manuel Miranda is telling Hamilton's story. Lucky Mr. Hamilton. Lucky us. Here’s to Lin-Manuel Miranda, the new king of American musical theatre. Long may he reign. 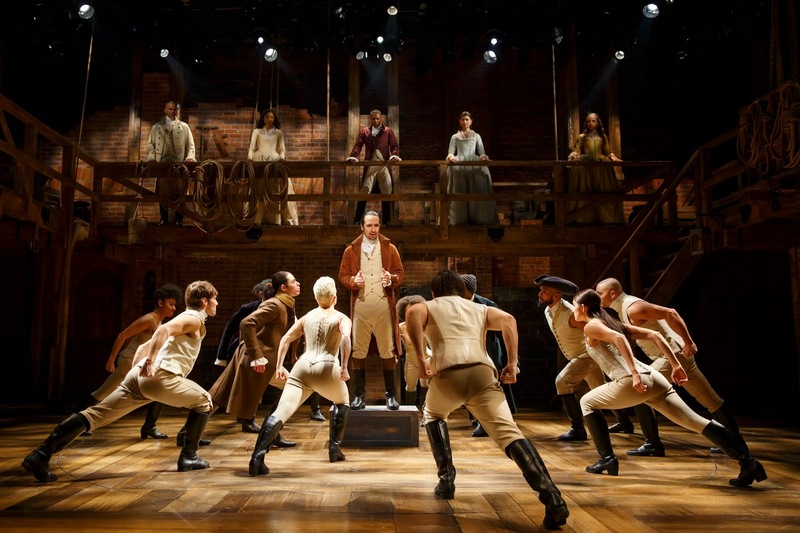 ~ Molly Matera, signing off….if you miss it at the Public Theatre, Hamilton is moving to Broadway this summer.